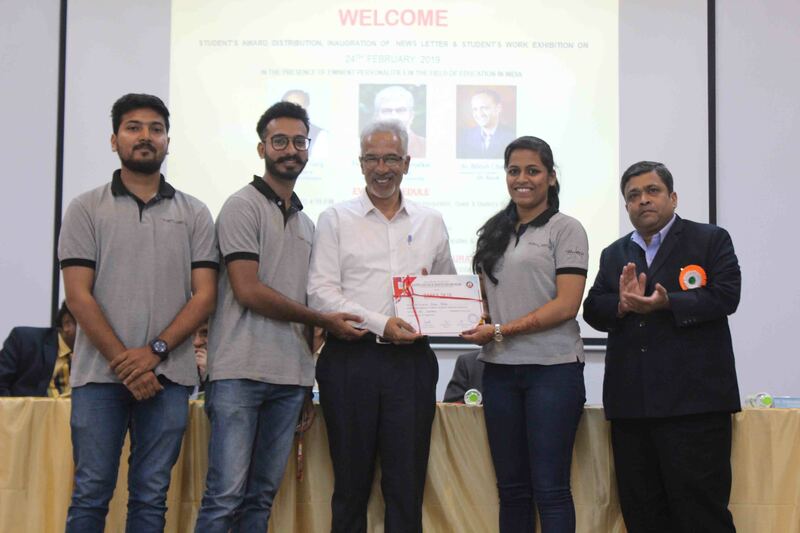 Installations:Ritesh Lohar, Aniket Wayal, Akanksha Patankar, Ankita Patil, Yash Paliwal, Yukta Bhojane, Parth Bhave, Aditi Shah, Shraddha Golande, Diksha Bhosale, Rupanshu Rawade, Rohit Nila. It is a chance to celebrate student’s hard work with architectural fraternity, friends and family. As the exhibition is open to the public, it is also great exposure for students and their careers. 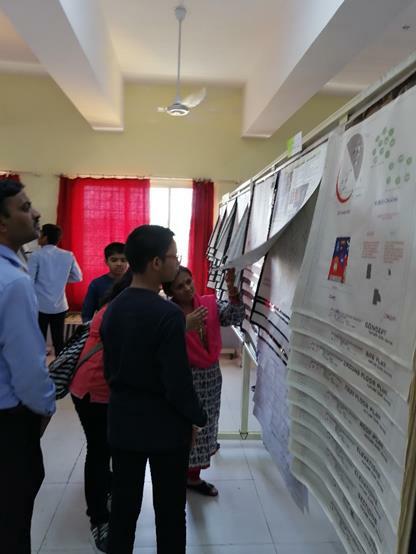 Displaying the drawings, models, competition entries and group work done by the students in the year 2018-19. 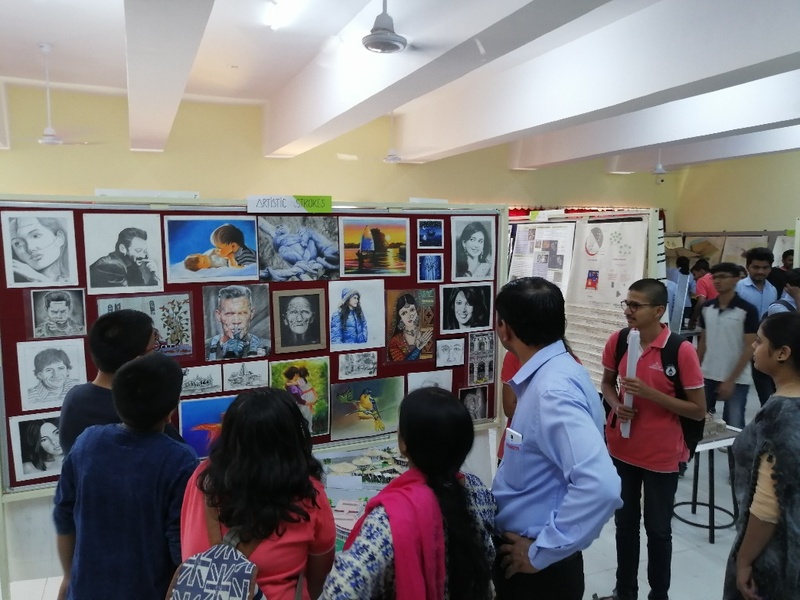 Exhibition also helps to motivate the students to work in a positive direction and inculcate a positive competitive spirit. 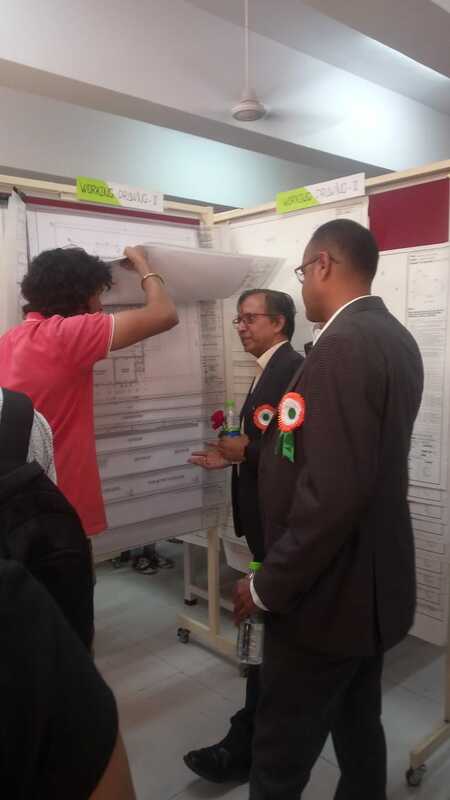 Dignitaries giving their feedback about the students work. Visitors appreciating the skills of painting, sketching & photography of the the students of SBPCOAD exhibited in the Annual Exhibition. 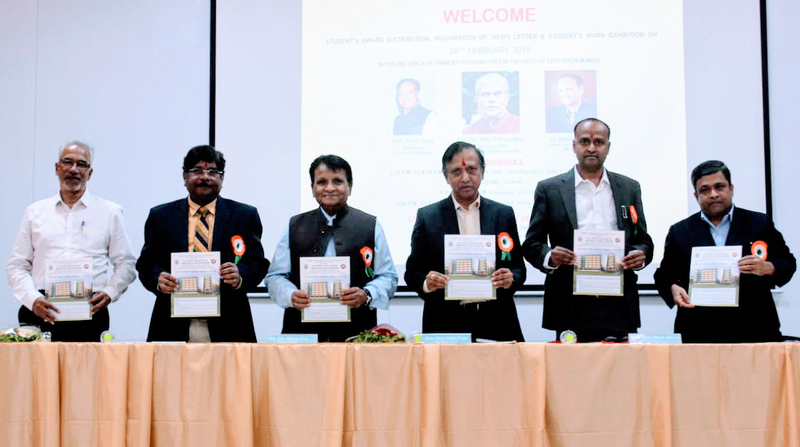 The other eminent personalities on the Dias were, Ar. Prashant Deshmukh and Ar. Pushkar Kanvinde. PCET Hon. trustee members Shri. Vitthal. 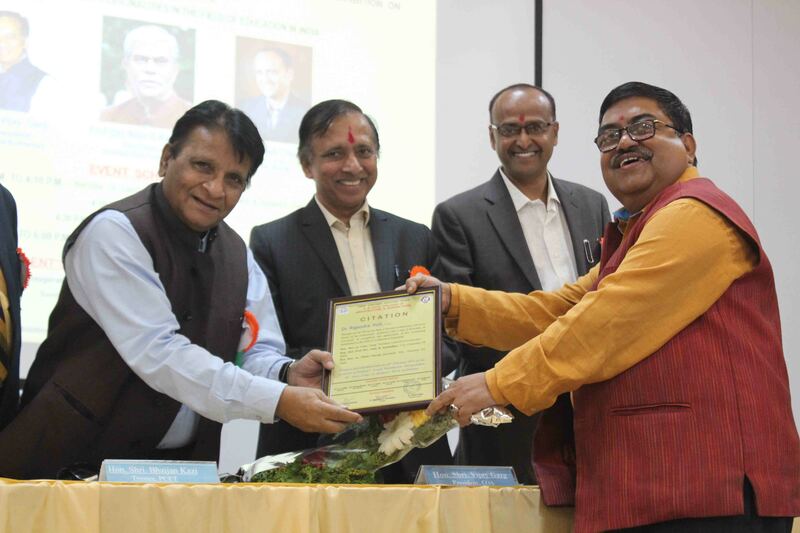 S. Kalbhor, (Secretary), Shri. Shantaram D. Garade (Treasurer), Shri. 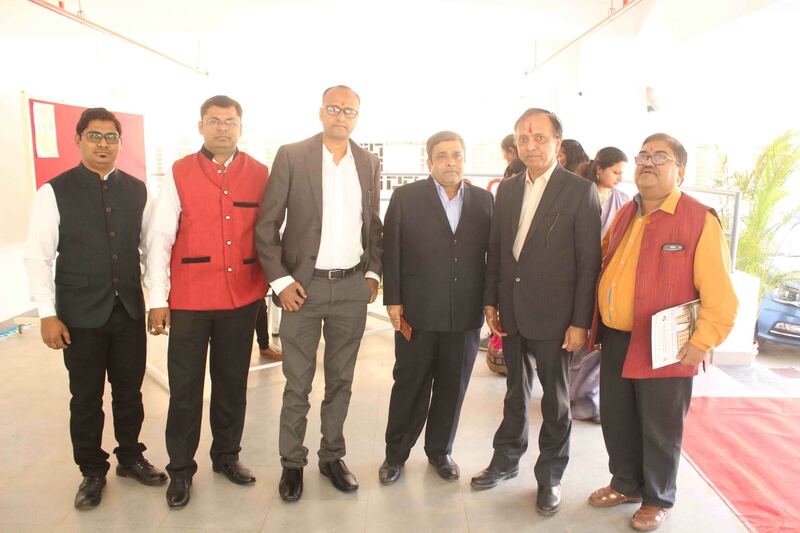 Bhaijan Kazi, (Trustee), Dr. Girish Desai (Executive Directive) were present for the Event. 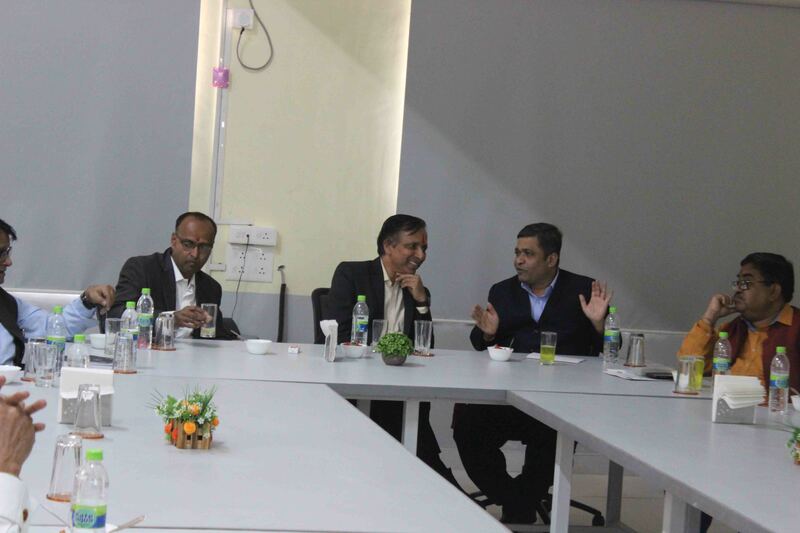 BRIEF OF THE EVENT:The program focused on the Interaction with the great personalities. Chief Guest of the event was Hon. Shri. Ar. 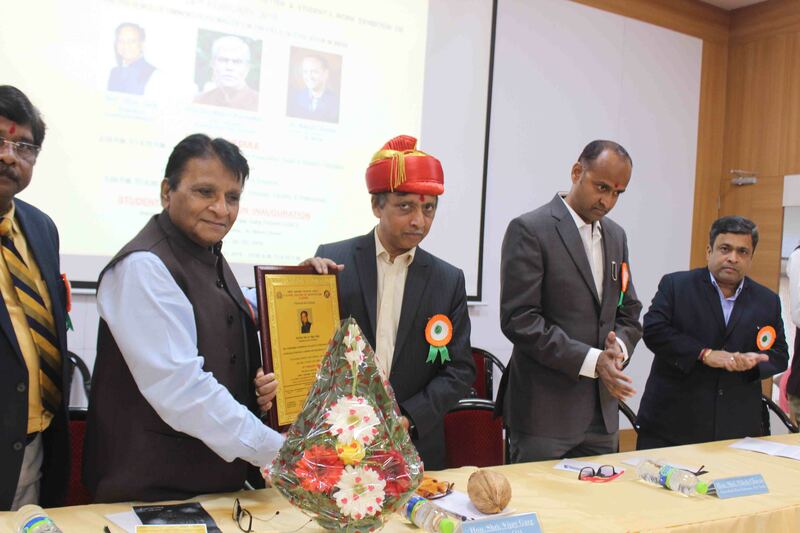 Vijay Garg Sir, President of Council of Architecture, (All India), New Delhi, and the Guest of Honor was Hon. Ar. 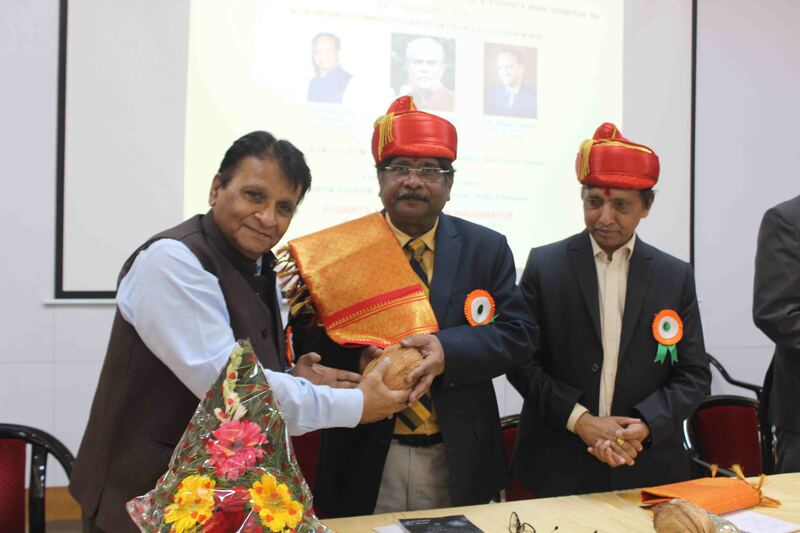 Nilesh Chavan, Immediate Past Chairman of Indian Institute of Architects (IIA), Nashik. This is also for the showcasing the following things. For this programme student’s parents were invited. 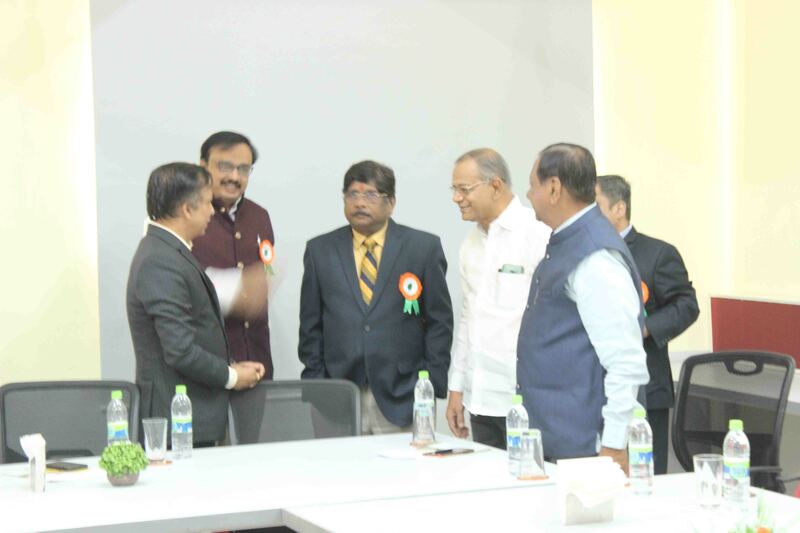 Also key personalities from Academic field Principals of various colleges were present. 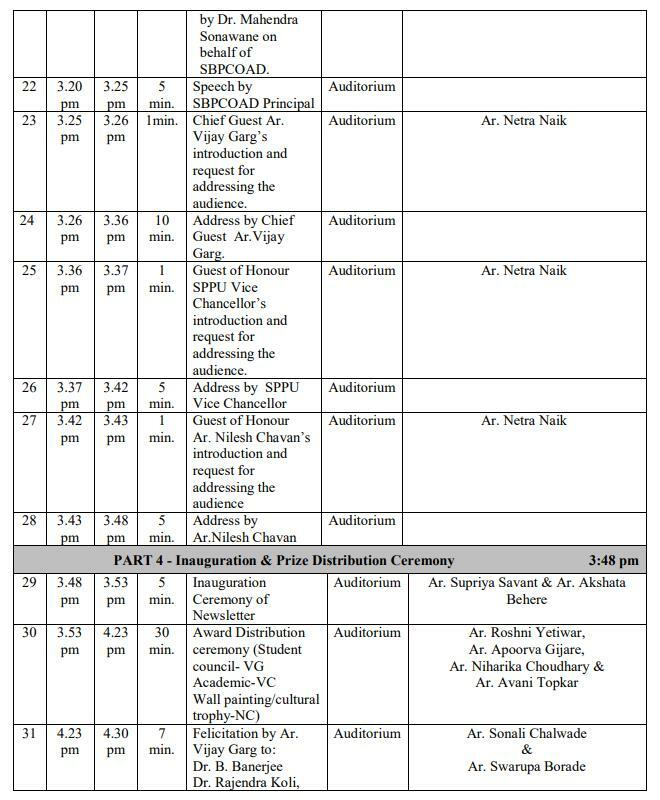 The Schedule of the Event is as mentioned below. 1. 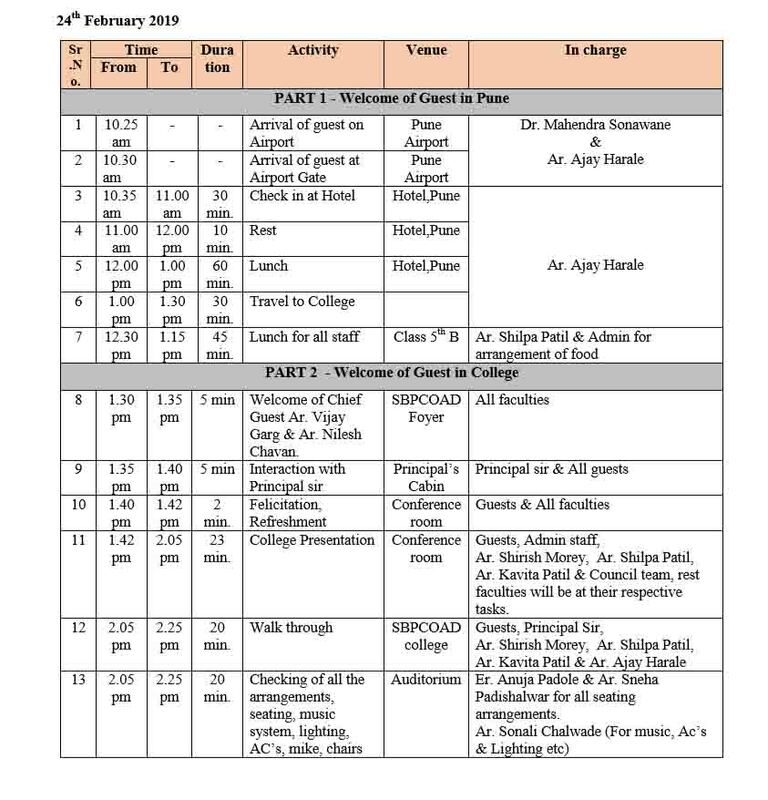 Welcome of the guest in the College The Chief guests Ar. Vijay Garg, Ar. 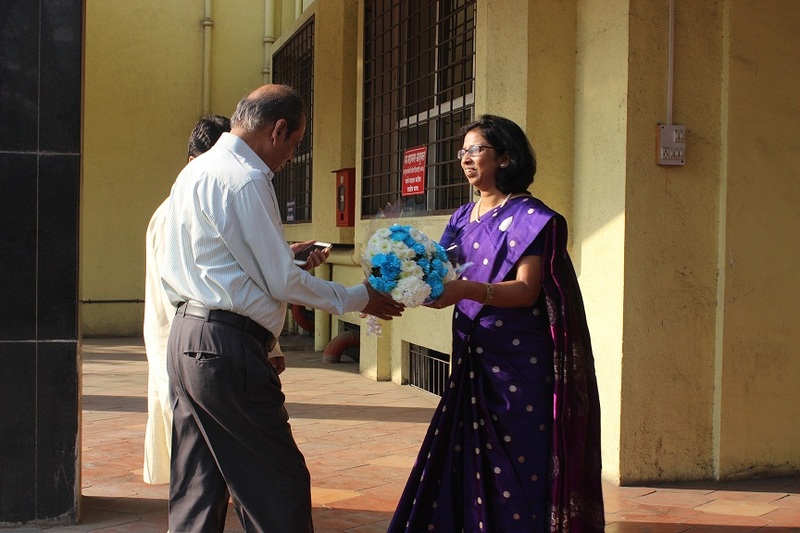 Nilesh Chavan and Dr. Koli ( Principal, APCOA) arrived at College foyer at 1:30 pm. 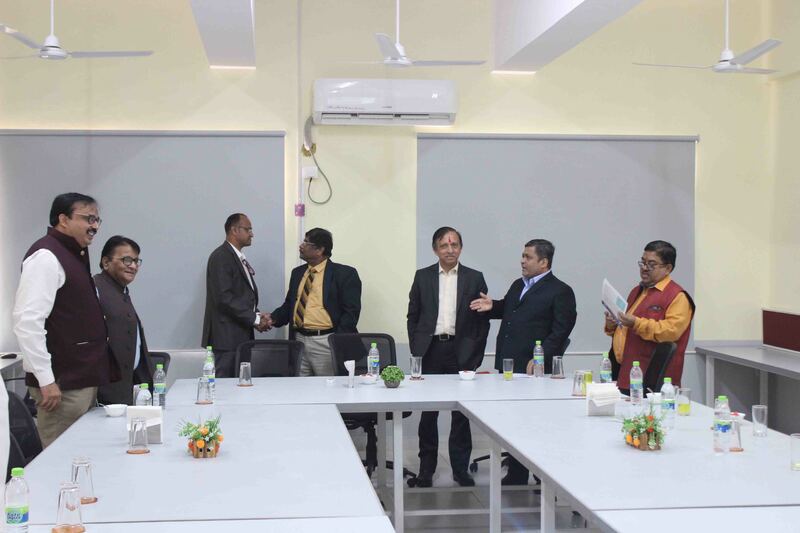 Dr. Mahendra Sonawane, Registrar Yogesh Bhavsar along with faculties and students council members welcome the guest. 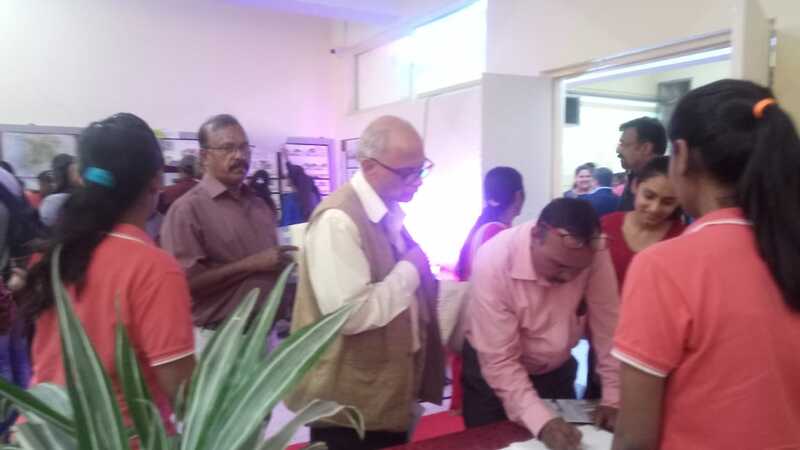 Co incidentally Prof. Anil Sahasrabudhe (Chairman, AICTE) was at PCET engineering college event Inauguration. It was a great informal meeting between both the guests. 2. 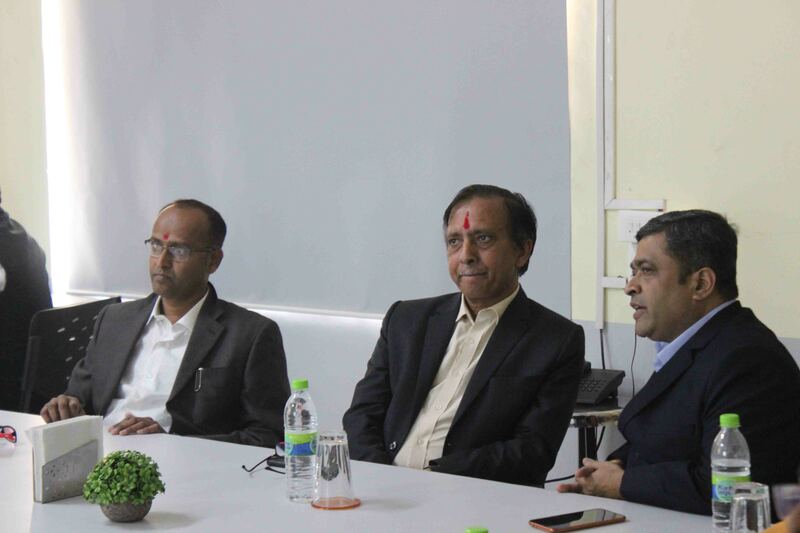 Principal and Guests Interaction Dr. Mahendra Sonawane welcomes the Guests at Principal Cabin and given brief Introduction regarding College, PCET Trust. 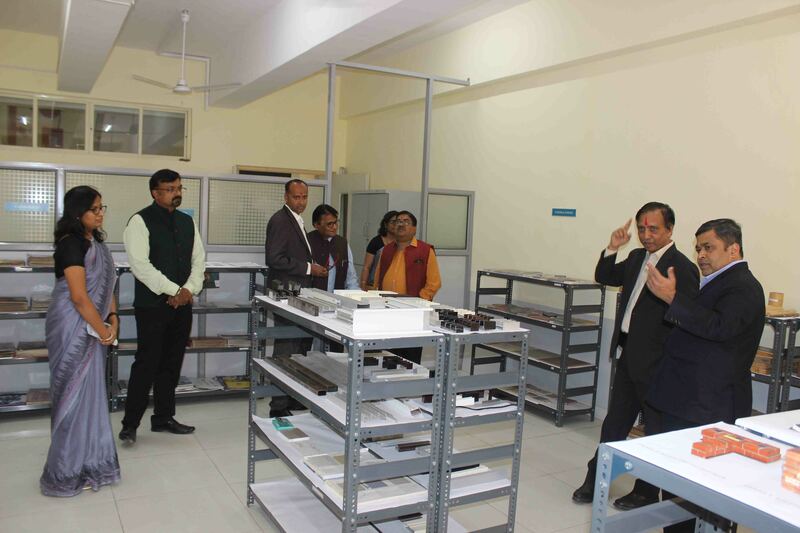 He has explained all the Innovative systems of the college viz. 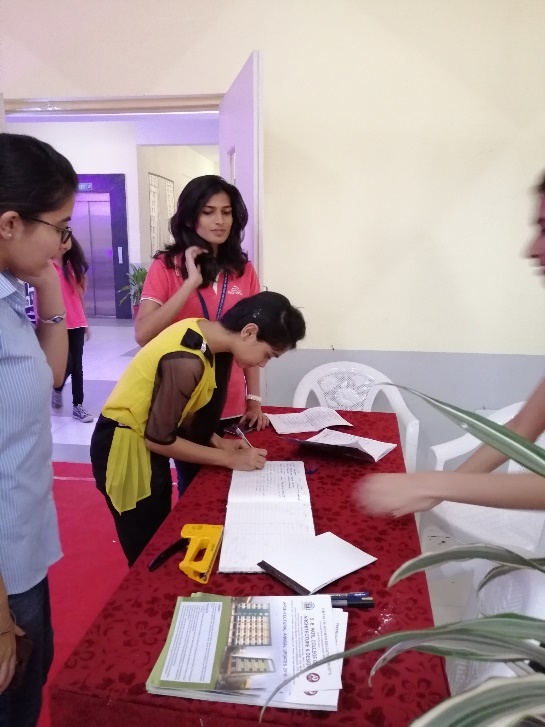 Google sheet filling for attendance, Thesis log book for the Progressive marking and process, Exam result sheets for Analysis, filing systems for the Inspection etc. 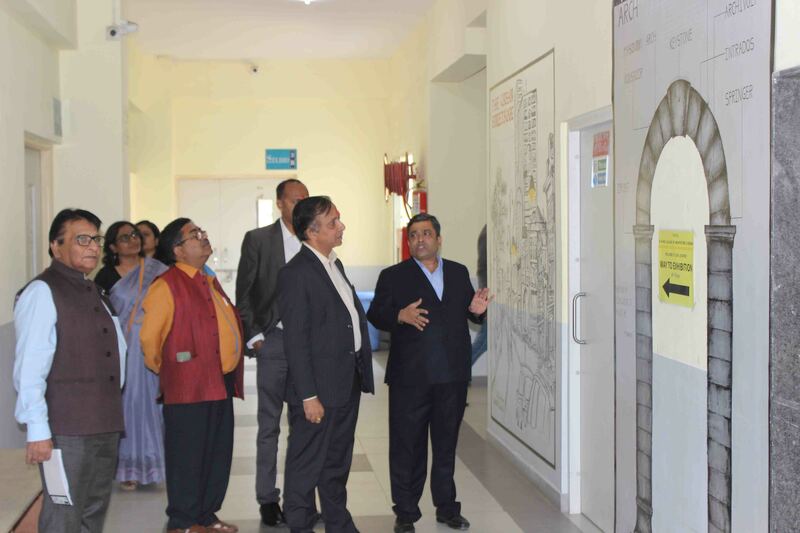 3.Walk through the College Ambience, Wall painting, Labs and Material Museum Dr. Mahendra Sonawane show cases the wall paintings on different themes, concepts and the architectural work produced by the students. Chief Guest Ar. Vijay Garg and Ar. 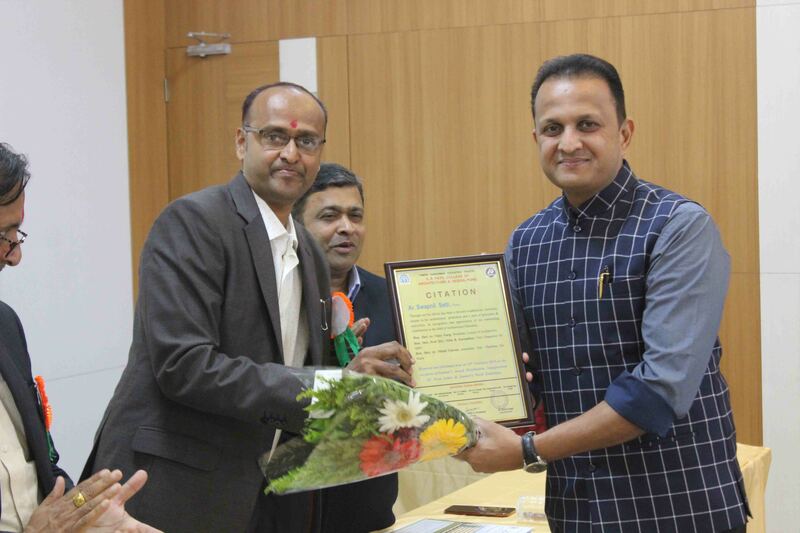 Nilesh Chavan appreciated the efforts made by the team in just one year. Librarian Mrs Poonam Sangale explained the details regarding Library and availability of the number books and Journal than as per requirement of COA norms. Also she added the E journals, Software and other facilities. 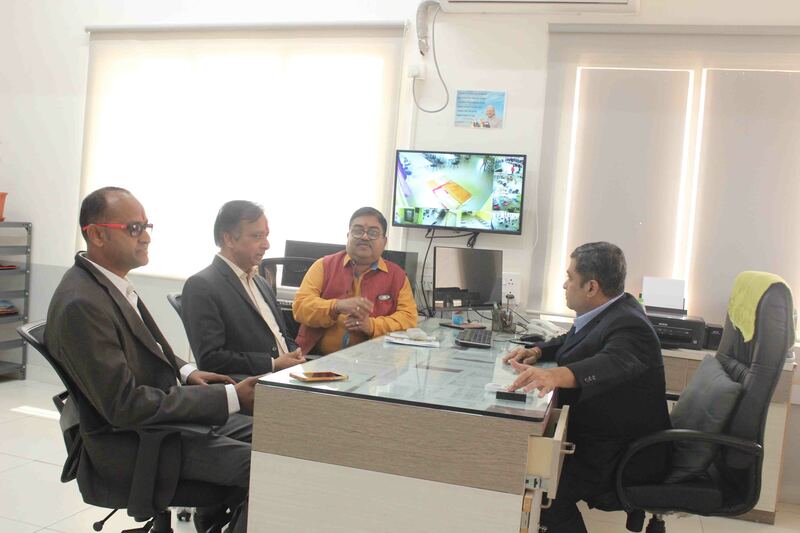 The Guest appreciated the Library set up and development. 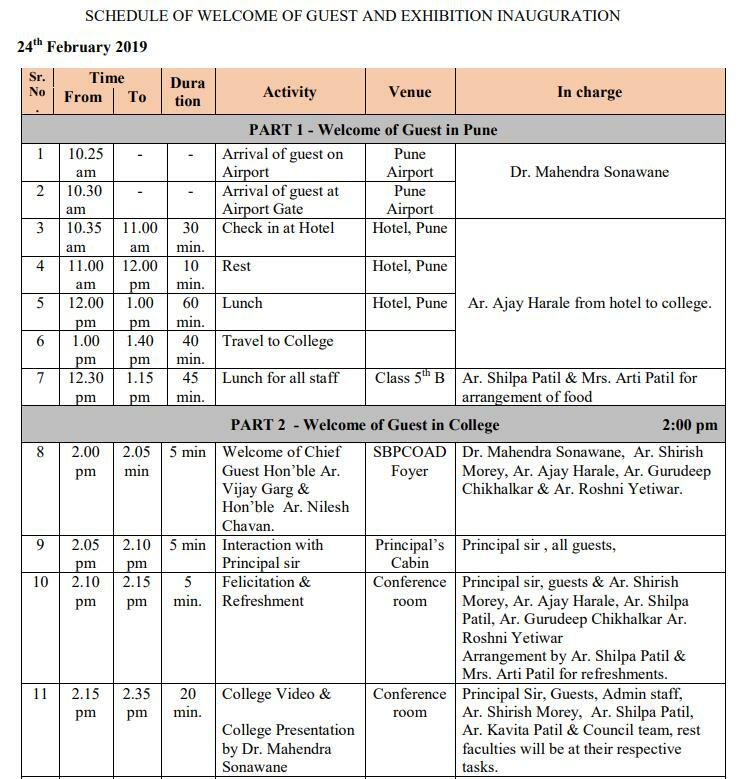 4.Presentation in the Conference room regarding Academic session 2018-19 Dr. Mahendra Sonawane presented the details about College set up, Infrastructure, Core faculty, visiting faculty, Non-teaching staff details, Co-curricular & Extracurricular Activities. For this presentation Chief Guests, Governing body member Ar. 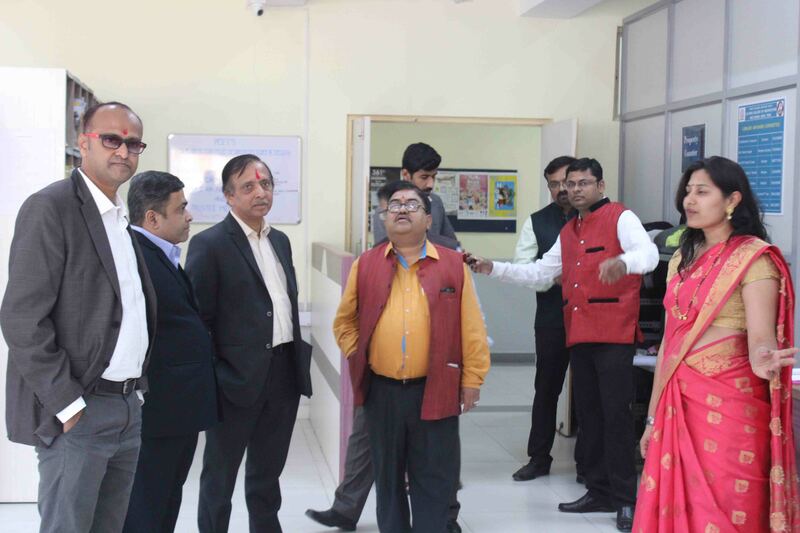 Prashant Deshmukh, Hon’ble Trustee member Shri Bhaijan Kazi, PCET Executive Director Dr. Girish Desai were present. 5. 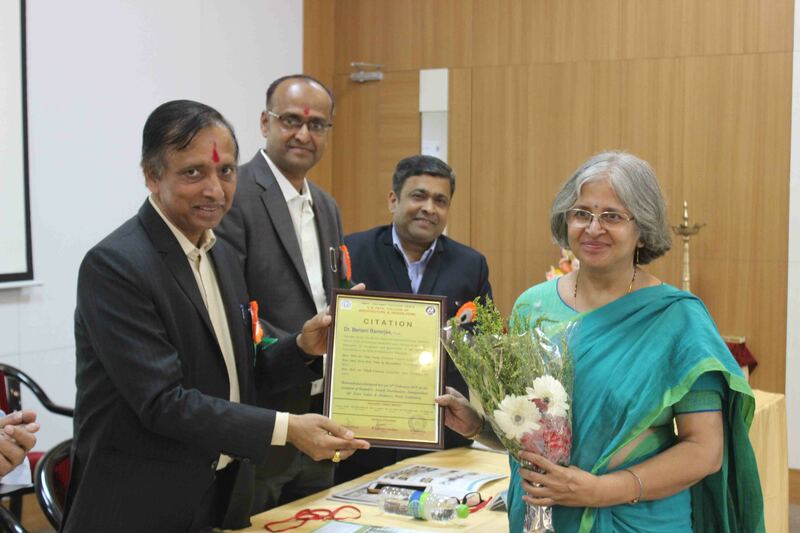 Newsletter Inauguration, Student Felicitation & Principal This year SBPCOAD has launched their ‘Architectural Newsletter’. 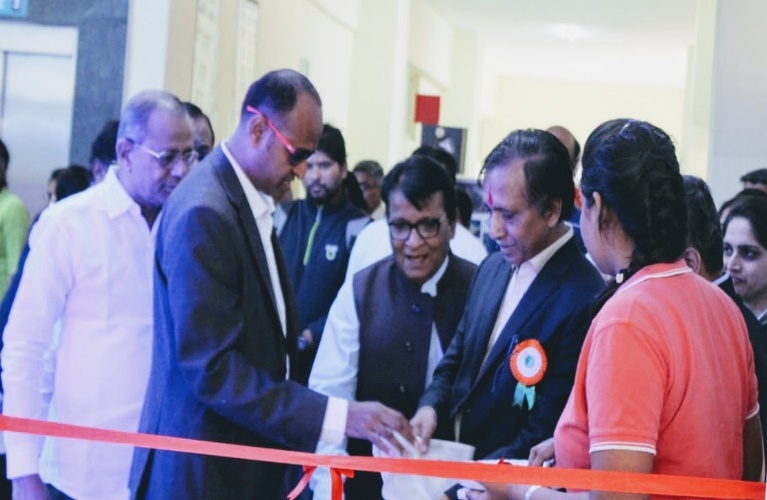 It was inaugurated in the presence of the Chief Guest Ar. 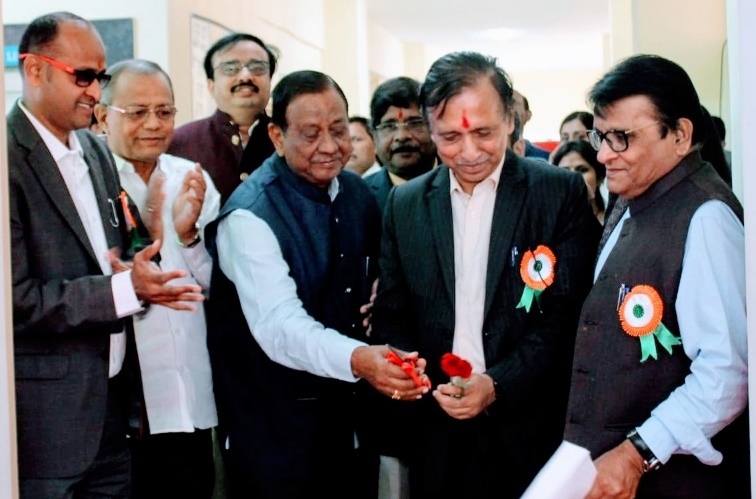 Vijay Garg, Guest of hon. Ar. Nilesh Chavan, Ar. Prashant Deshmukh, Ar. 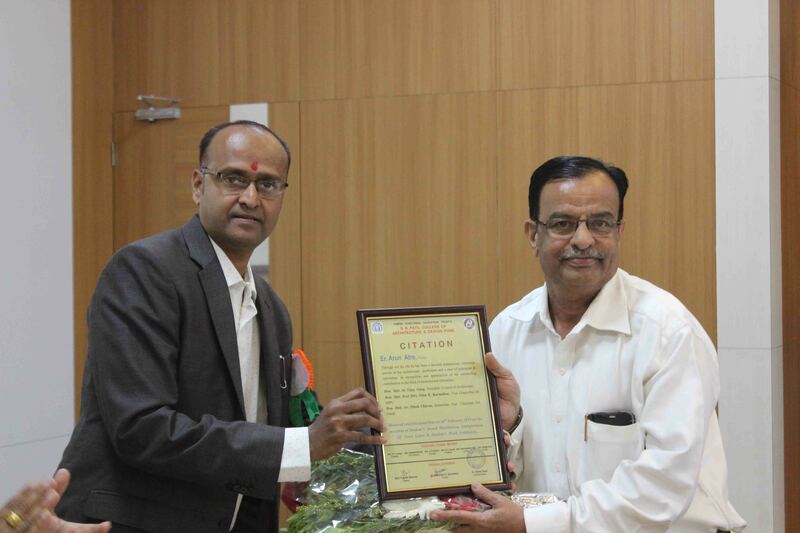 Pushkar Kanvinde, Principal Dr. Mahendra Sonawane, Hon. 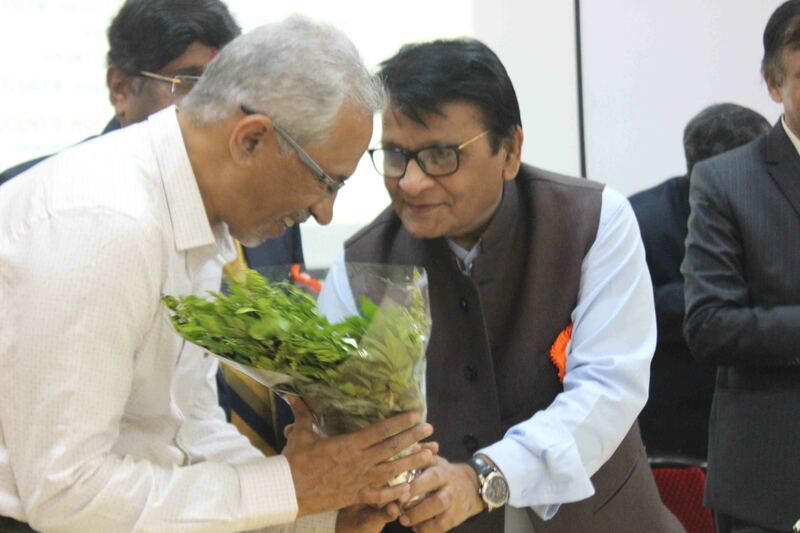 Trustee member Mr. Bhaijan Kazi and Executive Director Dr. Girish Desai. 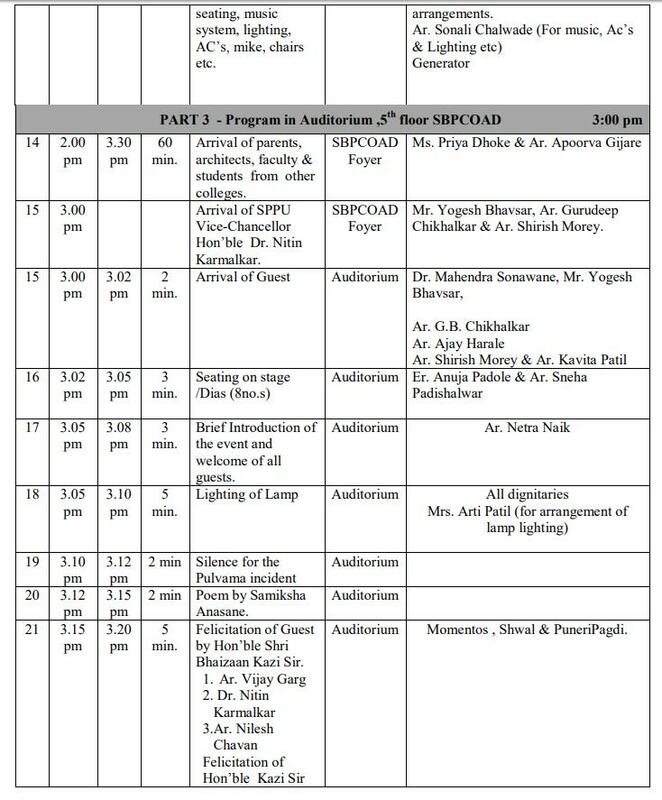 The Inaugural programme start with Lamp lightning ceremony. 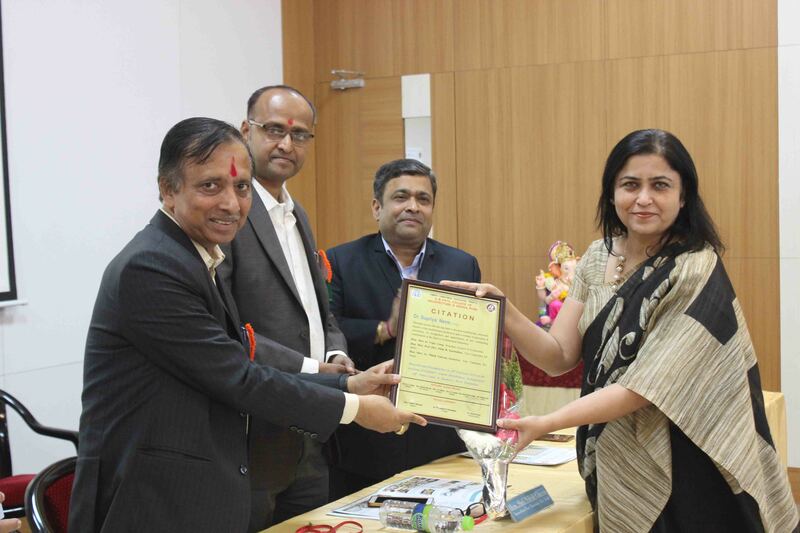 Prof. Netra Naik introduced all the guests on the dais and Felicitation programme was conducted. All kept silence for a minute for martyr soldiers during Pulvama attack. Student Miss Anasare has presented the poem dedicated to the Indian soldiers. Ar. 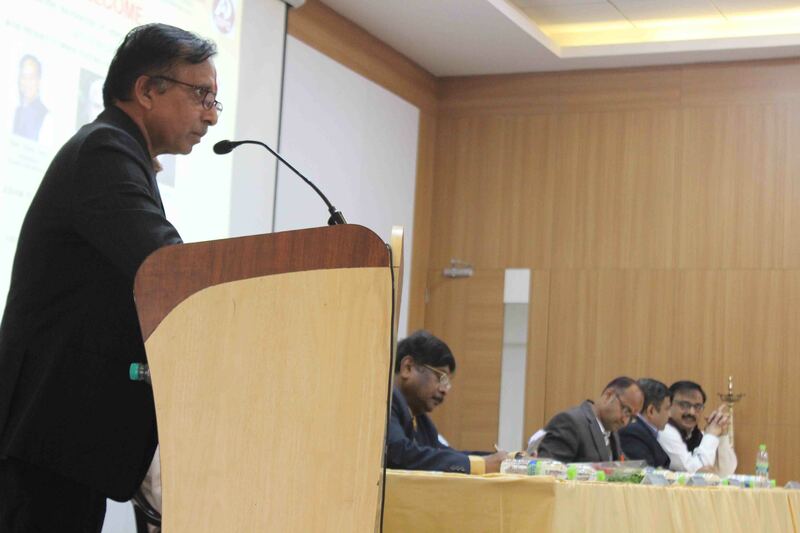 Vijay Garg – During the speech Ar. 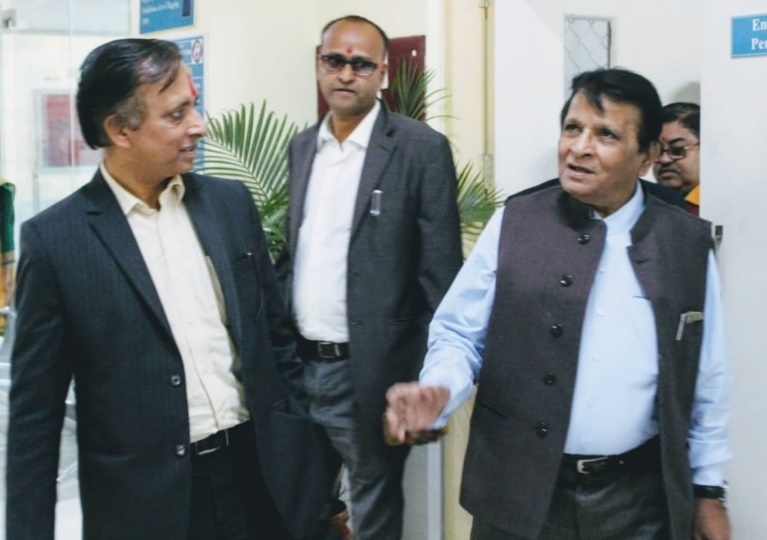 Vijay Garg appreciated the efforts made by Dr. Mahendra Sonawane and team. He said that this college is new but the quality of the work is better and above average than the work produced by Old colleges. Ar. Nilesh Chavan – Ar. 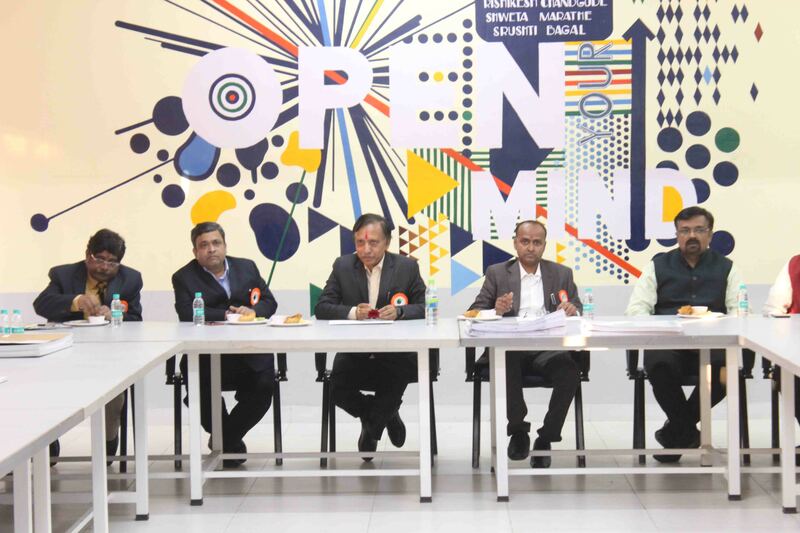 Nilesh Chavan has shared his thoughts and explained the responsibilities of the Institutes to create Students with the good skill and practical knowledge. Dr. Mahendra Sonawane shared the vision and action plan of the SBPCOAD and the overall development college has made in one year. Trustee Bhaijan kazi, Ar. Prshant Deshmukh and Ar. 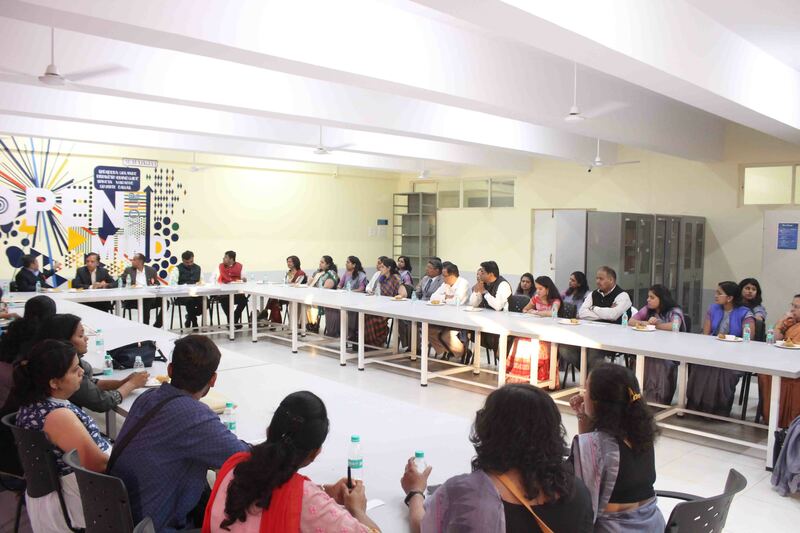 Pushkar Kanvinde also addressed to students, visitors, Professionals and Parents. Guests Felicitate the Students who are rankers in the academics, Co-curricular, Extracurricular. 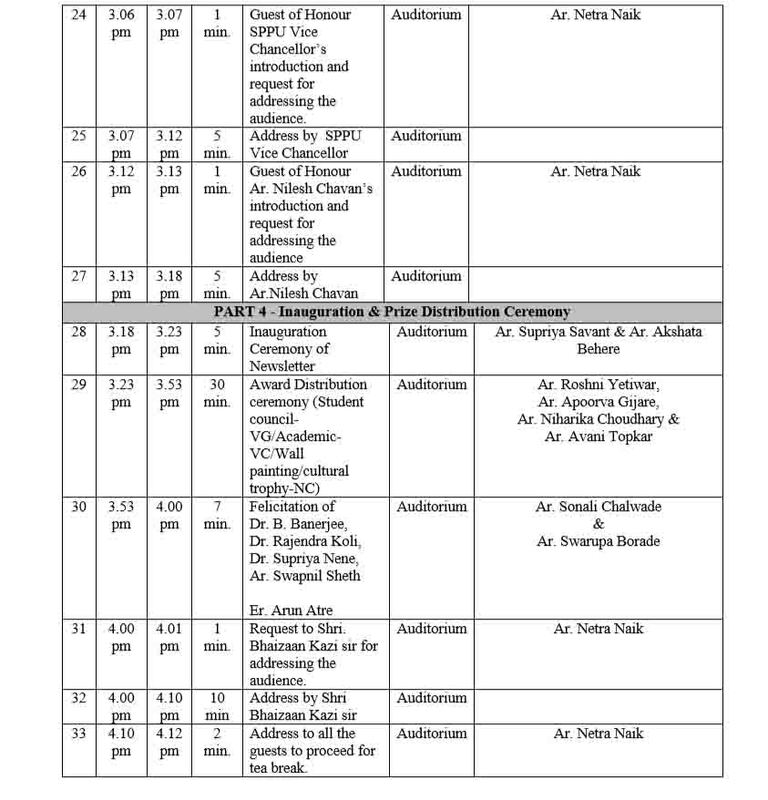 6 guest faculties Dr. Koli, Dr. Banerjee, Dr. Supriya Nene, Ar. Swapnil Sheth, Er. 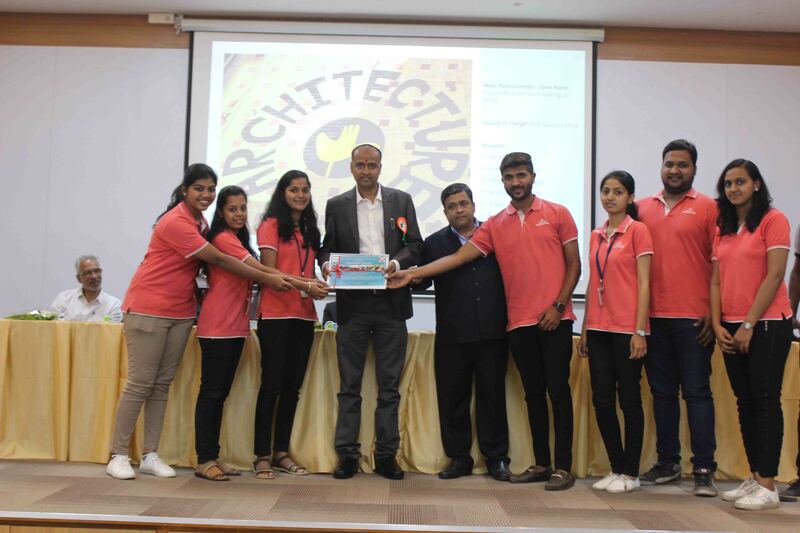 Arun Atre were felicitated by the Chief Guest for their dedication in the field of Architectural Education field. Chief Guest Ar. Vijay Garg Addressing the audience. 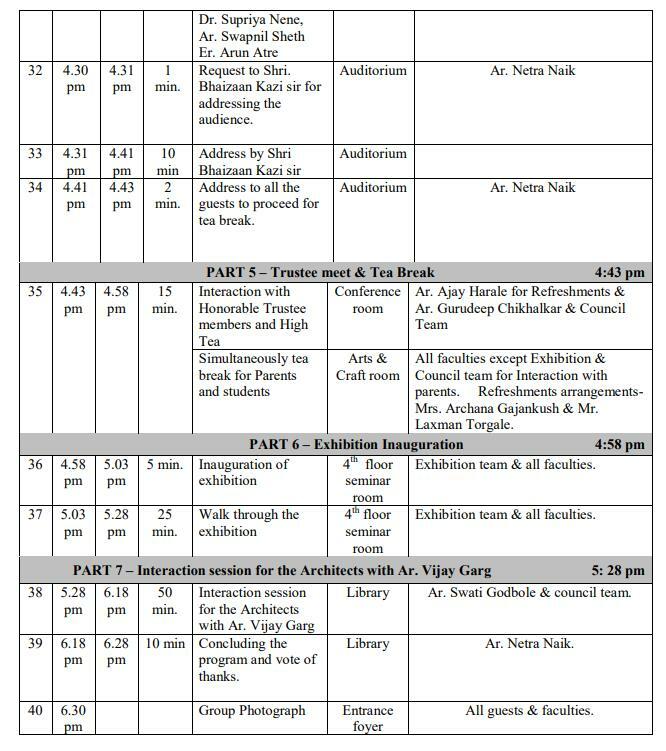 Speakers: S B Patil college of architecture and design is hosting an exhibition “MRUNMAY”. 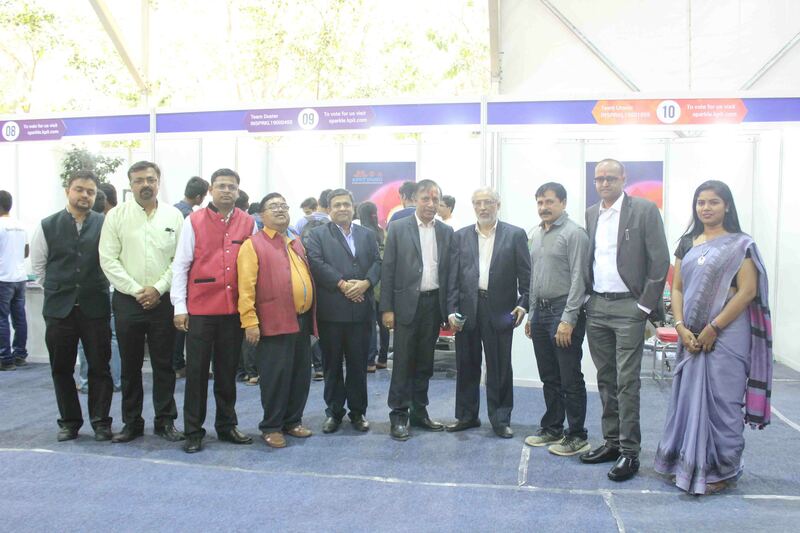 This is the annual exhibition of the college. It was inaugurated at the hands of renowned architect Ar.Vikas Bhandari on 8th February 2017. 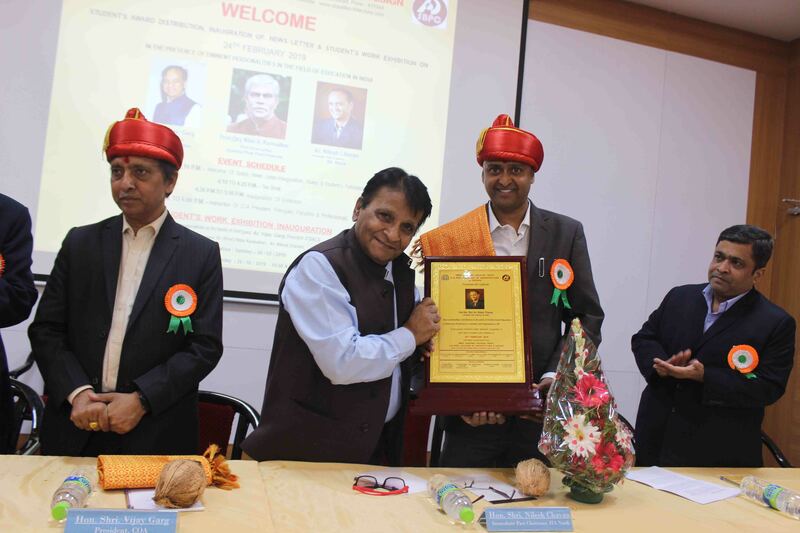 This inaugural function was also graced by Director of PCET campus Dr.Girish Desai ,Principal of the college Ar.Ujjwala Palsuley and Ar.Vikram Hundekar. At this occasion Ar. 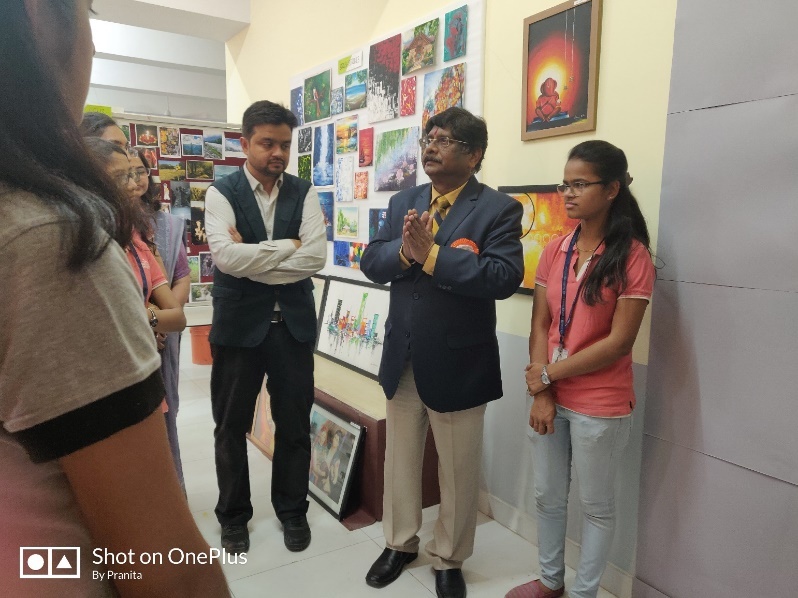 Vikas Bhandari addressed the students about the various fields in architecture and also talked about the ancient architecture and their sustainable strategies. 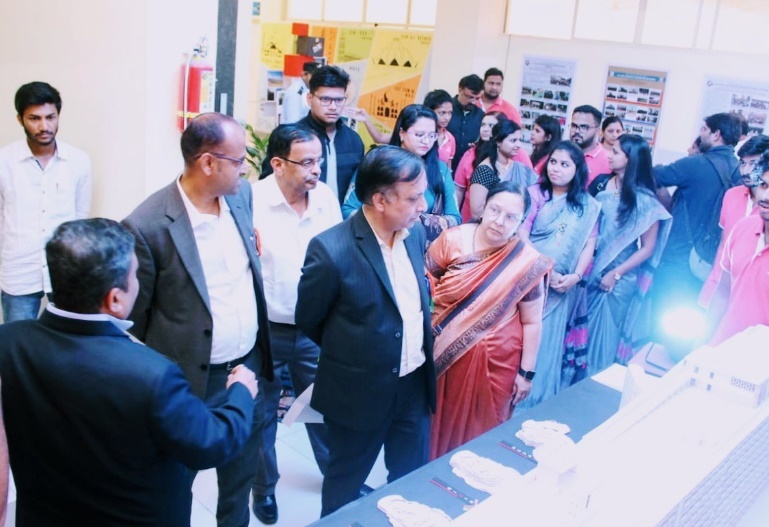 Also along with the exhibition our annual magazine “AICA” was inaugurated by the chief guest, along with other dignitaries on the dice. 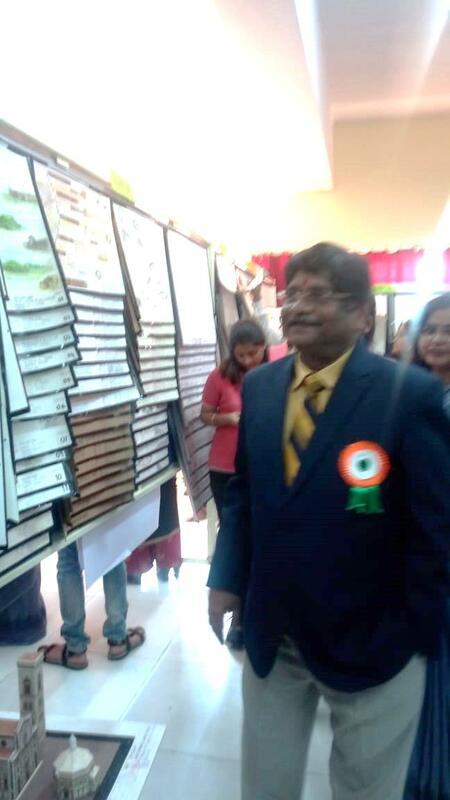 The annual exhibition is the display of students work academic as well as non academic. The exhibition will be on 8th and 9th February 2017. 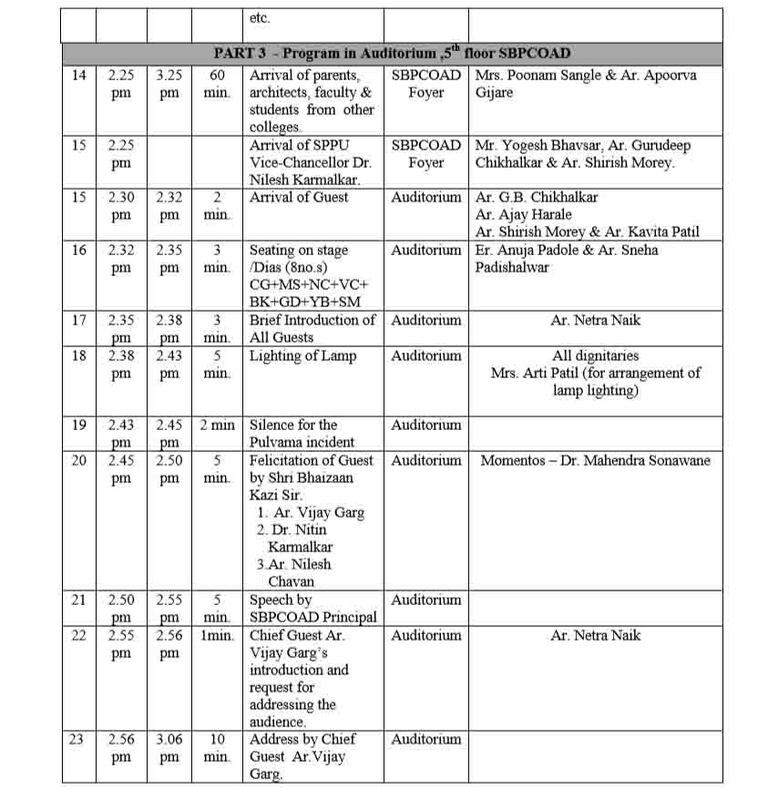 Venue: First floor, New Architecture Building, PCCOE campus, Nigdi, Pune Theme: "MRUNMAY-THE SEED"
Ar. Apoorva Gadgil Gijare, Ar. Prajakta Thamke. Purva Raisoni, Nahid Sheikh, Akshay Borati, Ankita Ghodke, Shraddha Golande, Sonia Kulkarni, Mansi Shetty, Tejashree Shelke, Shweta Marathe from 3rd year. OBJECTIVES: 1. 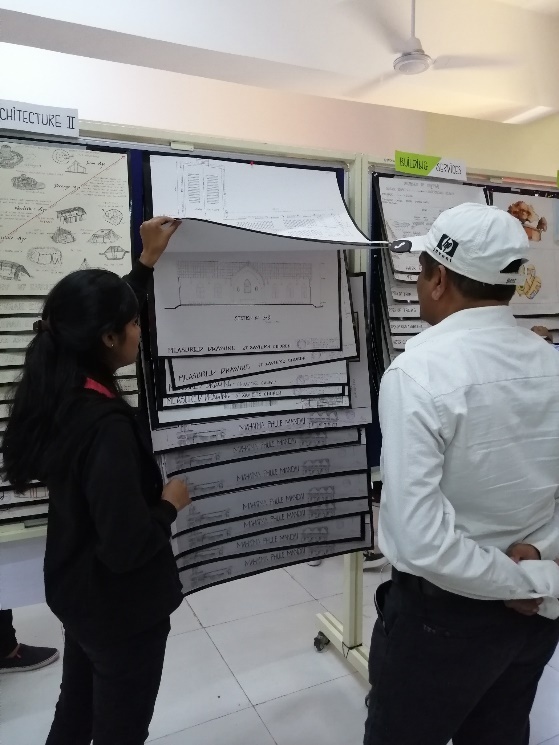 Displaying the drawings, models, competition entries and group work done by students in the year 2017-18. 2. 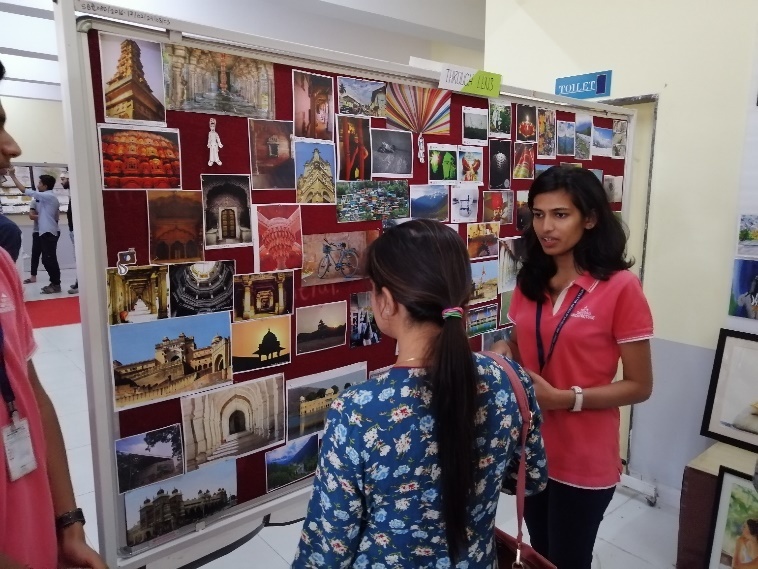 Exhibition also helps motivate the students to work in a positive direction and inculcate a positive competitive spirit. Exhibition 2017-18 “MRUNMAY-THE SEED” This year the theme for the exhibition was derived from the last year’s theme “Mrunmay –The Earth”. “Mrunmay –The Seed” marks the next year of exhibition. The venue for the exhibition was decided as the new architectural building in PCCOE campus. 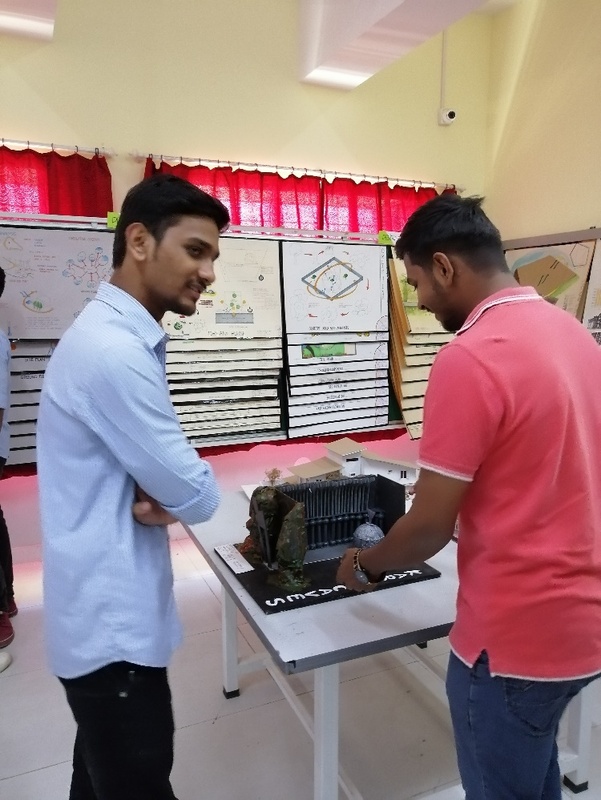 Student volunteers from 3rd year headed the complete student team of exhibition. They did a proper listing of portfolios, models, sketches and photos. The collection and returning of the work was handled with minimal chaos. - Settlement study of Goa and Alibaug. - Design project ranging from play areas to highrise apartments. - BTM, ADG, Landscape sheets and models. - Entries to national and international competitions like ACARA 2017 and UNBOX 2017. - Creative corner for sketches and photographs. - Zen tangle panels were displayed. These were made in the competition hosted with theme Earth in architecture. 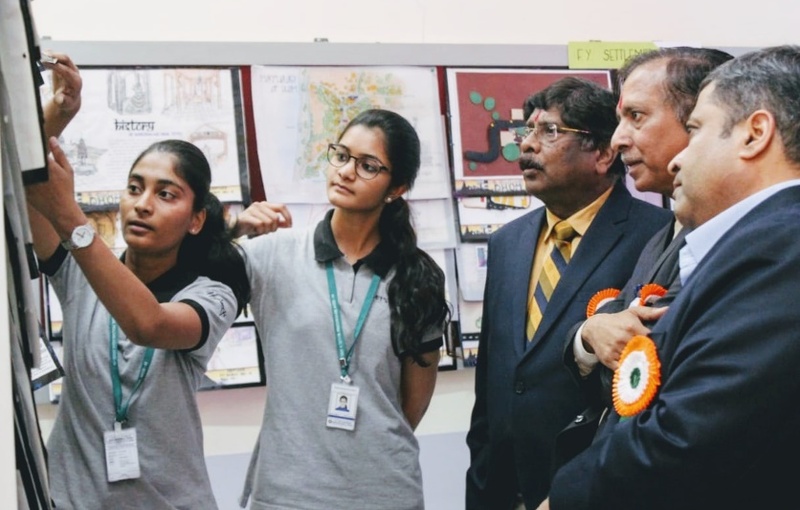 This year an initiative to digitalize the work done by students was taken in the form of Digital panels which can be retained to be displayed in the new building. Exhibition and Magazine inauguration @ 11.00 am Magazine and exhibition inauguration by Ar. 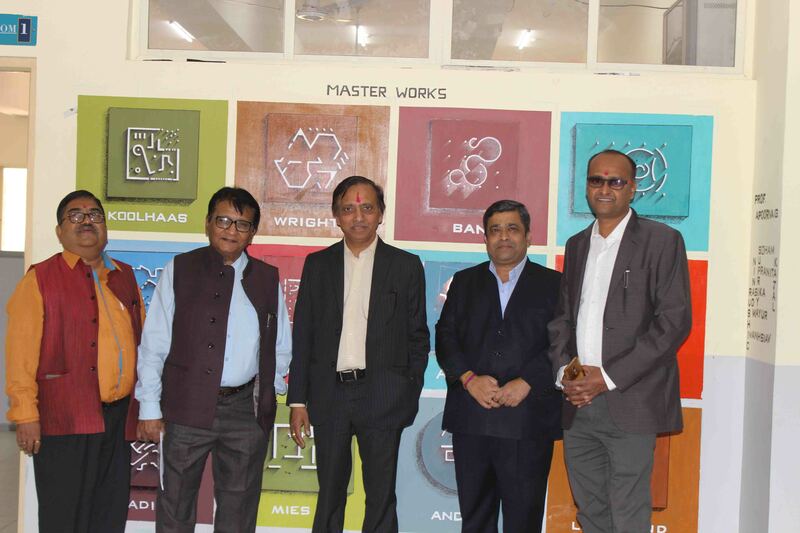 Abhijeet Shirodkar from AMITY Panvel, Trustee Mr. Bhaizaan Kazi, Dr. Mahendra Sonawane, Ar. Ajay Harale, Ar. Gurudeep Chikhalkar and Er. Kad Sir. Exhibition open from 10.00am to 6.00 pm. Visit by students from S.B. Patil school, Ravet. 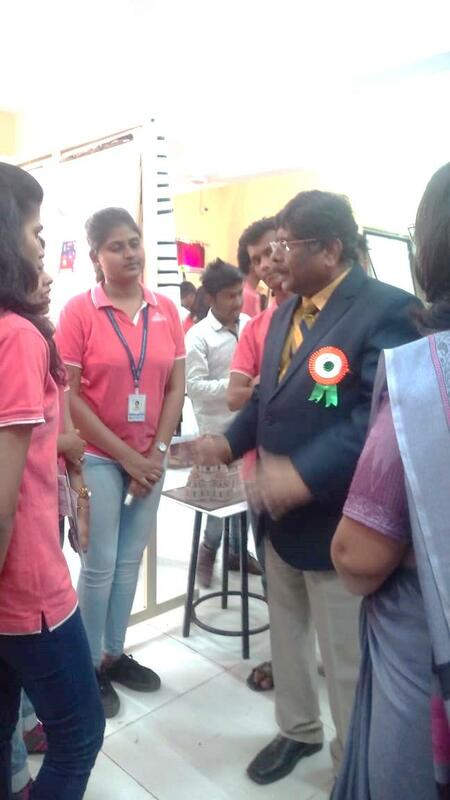 Students and Professors from PCET campus visited the exhibition along with family of students. Exhibition open from 10.00 am to 6.00 pm. 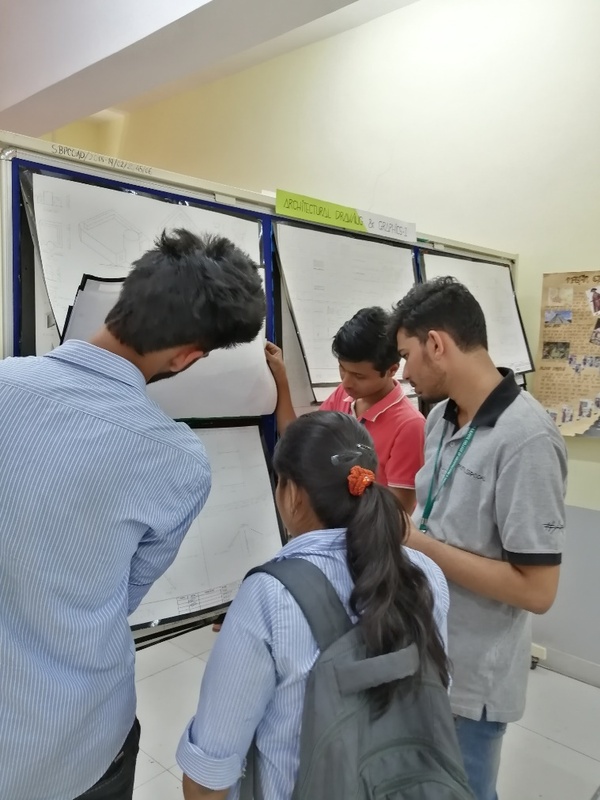 Students from other architecture colleges and architects visited the exhibition. Pack up after 6.00 pm and shifting all exhibition material and dead stock to old building.